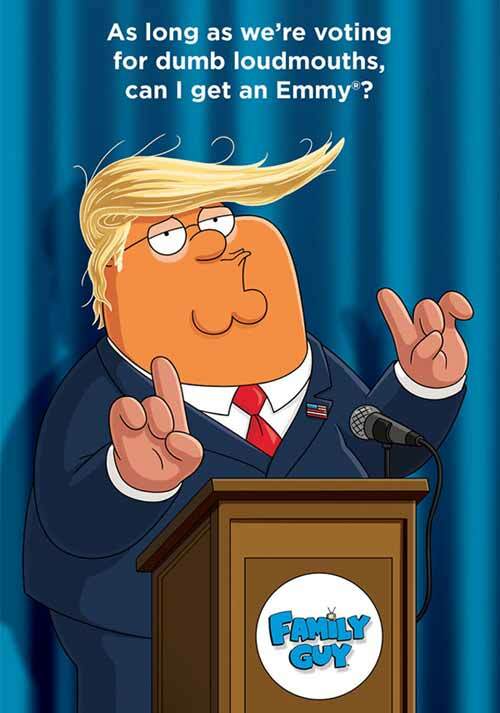 “As long as we’re voting for dumb loudmouths, can I get an Emmy?” says the latest ‘For Your Consideration’ Emmy ad from FOX’s long-running animated series “Family Guy” (see it below). Of course, the ad is referring to Donald Trump, who took another big step towards the Republican presidential nomination this week as his opponents Ted Cruz and John Kasich dropped out of the race. Whoever might be offended by Seth MacFarlane‘s brand of humor, the show has had a solid run at the Emmys, winning five times overall: Best Voice-Over Performance for MacFarlane (2000), Best Music and Lyrics for “You’ve Got a Lot to See” (2002), Best Individual Achievement in Animation (2007, 2010) and Best Sound Mixing (2011). The show even scored a nomination for Best Comedy Series in 2009, which made it the first animated series since “The Flintstones” (1961) to contend in that race. However, “Family Guy” didn’t win Best Comedy Series that year (“30 Rock” picked up its third in a row), and it hasn’t won Best Animated Program either despite four nominations in that race (losing to “The Simpsons” in 2000, 2005 and 2008 and to “South Park” in 2005). Do you think the show will rule the Emmys this year? Squish! Donald and Melania Trump get pelted with Razzie Award nominations! 'Family Guy': Top 40 greatest episodes ranked worst to best - Can you guess what's #1? Will reigning Best Character Voice-Over Emmy champ Seth MacFarlane be taken down by... Seth MacFarlane?